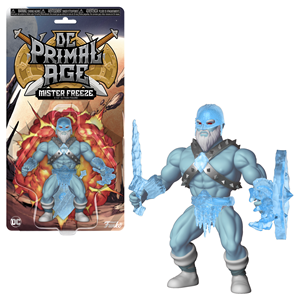 Funko, Warner Bros. Consumer Products and DC Entertainment Launch New Retro-Style Action Figures, DC Primal Age Action Figures | Funko, Inc.
EVERETT, Wash., Oct. 04, 2018 (GLOBE NEWSWIRE) -- Funko, Inc. ("Funko") (Nasdaq: FNKO), a leading pop culture consumer products company, in partnership with Warner Bros. Consumer Products (WBCP) and DC Entertainment, today announced the launch of DC Primal Age, a new line of action figure toys featuring retro-style barbarian fantasy themed Super Heroes and Super-Villains from the DC universe. The inaugural line will be available for purchase starting October 5, 2018 on Amazon.com. This press release contains forward-looking statements within the meaning of the Private Securities Litigation Reform Act of 1995. All statements contained in this press release that do not relate to matters of historical fact should be considered forward-looking statements, including statements regarding Funko’s launch of the DC: Primal Age action figure collection; anticipated fan reaction; merchandise strategy ; future product offerings; product release dates and product features. These forward-looking statements are based on Funko management’s current expectations. These statements are neither promises nor guarantees, but involve known and unknown risks, uncertainties and other important factors that may cause Funko’s actual results, performance or achievements to be materially different from any future results, performance or achievements expressed or implied by the forward-looking statements, including, but not limited to, the following: Funko’s ability to maintain and realize the full value of its license agreements; the ongoing level of popularity of Funko products with consumers; changes in the retail industry and markets for Funko consumer products; Funko’s ability to maintain relationships with retail customers and distributors; Funko’s ability to compete effectively; fluctuations in Funko’s gross margin; Funko’s dependence on content development and creation by third parties; Funko’s ability to develop and introduce products in a timely and cost-effective manner; Funko’s ability to obtain, maintain and protect its intellectual property rights or those of its licensors; potential violations of the intellectual property rights of others; Funko’s ability to attract and retain qualified employees and maintain its corporate culture; risks associated with Funko’s international operations; changes in U.S. tax law; foreign currency exchange rate exposure; the possibility or existence of global and regional economic downturns; Funko’s dependence on vendors and outsourcers; risks relating to government regulation; risks relating to litigation, including products liability claims and securities class action litigation; any failure to successfully integrate or realize the anticipated benefits of acquisitions or investments; reputational risk resulting from Funko’s e-commerce business and social media presence; risks relating to Funko’s indebtedness and its ability to secure additional financing; the potential for Funko’s electronic data to be compromised; the influence of Funko’s significant stockholder, ACON, and the possibility that ACON’s interests may conflict with the interests of Funko’s other stockholders; risks relating to Funko’s organizational structure; volatility in the price of Funko’s Class A common stock; and the potential that Funko will fail to establish and maintain effective internal control over financial reporting. These and other important factors discussed under the caption “Risk Factors” in Funko’s quarterly report on Form 10-Q for the second quarter of 2018 and its other filings with the Securities and Exchange Commission could cause actual results to differ materially from those indicated by the forward-looking statements made in this press release. Any such forward-looking statements represent Funko management’s estimates as of the date of this press release. While Funko may elect to update such forward-looking statements at some point in the future, Funko disclaims any obligation to do so, even if subsequent events cause its views to change. These forward-looking statements should not be relied upon as representing Funko’s views as of any date subsequent to the date of this press release.